With the weather brightening up, NYC is blooming with colorful spring dresses to toss on, wrap up and pair with your favorite sandals. Slip into the designs of the season at Rock Center boutiques. PAIGE: This denim specialist offers the cute, casual Haidee in a soft cotton and Tencel blend, with a cinched waist to complement the relaxed fit. Make it your little blue dress all through the summer. Maje: Take this long chiffon maxi dress for a spin at your next garden party (even the rooftop at Rockefeller Center!). A modern botanical print and ruffled hem with a high slit make it a flattering piece for day or night. Kate Spade: Keep the ruffles coming. The flowy V-neck sets apart this midi-length cotton poplin dress with a swingy, tiered skirt, a solid choice that's light as a feather in white or chartreuse. Free People: Part of the shop's Endless Summer collection, the Amaris Cocoon Tee dress is beach-ready with its pink and white "sunset" stripes and gauzy cotton texture. It's an easy piece for staying comfy and cool in the city, by the ocean, or at an outdoor show. Brooks Brothers: This famous name in tailored workwear is also a go-to for weekend outfits. From its Red Fleece line, the striped jersey flutter-sleeve shift dress has a light feel in rayon, with an instant nautical vibe in navy and white. 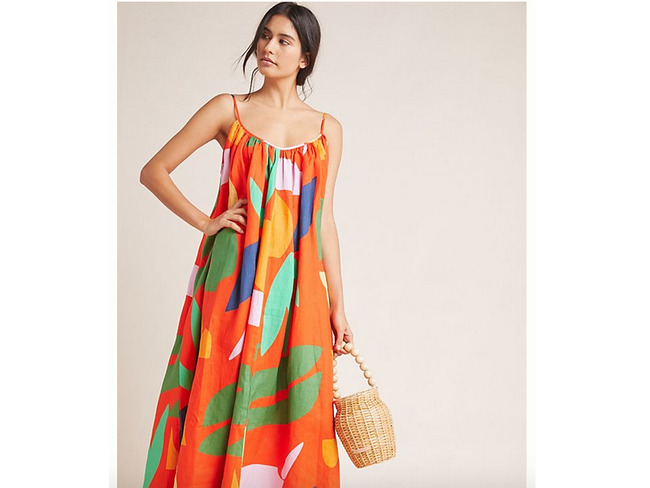 Anthropologie: Offering a twist on linen, this Mara Hoffman dress is vibrant in tangerine tones with an oversized pattern of leafy abstract forms. Spaghetti straps, a low back and loose, maxi shape make it a natural for sun-soaked days.